Wye Valley Butterfly Zoo01600 890360work ZooWalk with some of the world's most beautiful and delicate creatures as they fly around you. 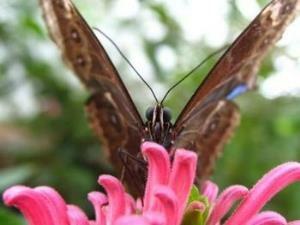 Watch as they emerge from their chrysalides, court, lay eggs and sup nectar from the many spectacular tropical plants. It's a safari, where you explore and hunt to find answers which baffled people for centuries. Why don't butterflies grow? How long do they live? Where do they lay eggs? How do you find caterpillars? What do they eat? What eats them? How do they survive? Find out about their incredible lives and learn how to attract native butterflies to your own garden. Walk with some of the world's most beautiful and delicate creatures as they fly around you. Watch as they emerge from their chrysalides, court, lay eggs and sup nectar from the many spectacular tropical plants. Turn off the A40 at Whitchurch and head south on the B4164 towards Symonds Yat West. At the roundabout take the Symonds Yat West exit. Follow the B4164 for 100 metres to find The Amazing Hedge Puzzle on your left, opposite the Old Court Hotel. Our Car Park is Free of Charge for Customers - the only free car park in the Symonds Yat area. If it is full, turn left out of our exit to find another car park 100 metres further on. Pay for parking and bring your parking ticket to our ticket office - we will refund the money when you buy tickets for The Amazing Hedge Puzzle.